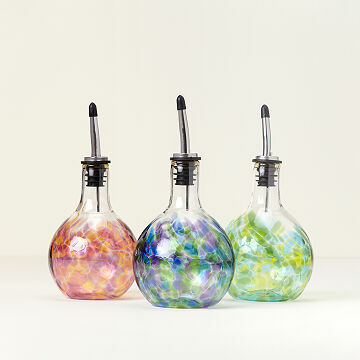 Crafted in three colorways, these oil pourers were inspired by the artist's trip to Greece. Moved by a trip to gorgeous Greece—where, they say, the olive oil flows freely—Rhode Island glass artist Jill Henrietta Davis whipped up these beautiful, delicate pourers. Each is handblown, crafted in one of three colorways inspired by the Mediterranean. With room for up to 12 ounces of oil, you won't find them empty anytime soon. And if vinegar's more your thing, fret not: that works, too. Handmade in Rhode Island. 5.5" H x 3.6" Dia. Hand wash with warm water and mild dish soap. Wash before first use. This vessel is absolutely beautiful. The one thing that didn't occur to me is that, once filled with olive oil, you really can't see all of the amazing colors. It would be awesome if you could make an opaque version! Pretty and useful...I love it! I use it to store my garlic infused olive oil. It works great...no leaking and looks beautiful sitting on my counter! I love it! I don't mind leaving this on the counter.